As most of our Social Networking followers already know, this month we have started a campaign on our YeahHub’s Official Twitter Page (@yeahhub). There has been a lot of confusion and questions related to this campaign, so here are some ground rules and terms with regards to this contest. 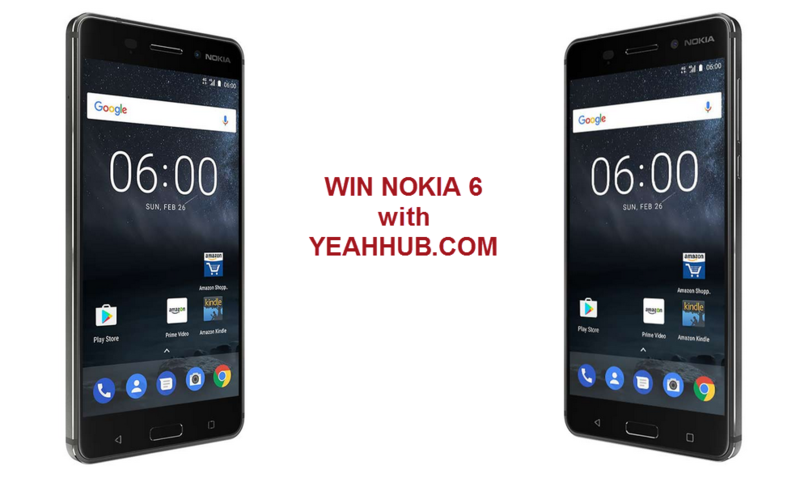 The grand prize for this month’s campaign is Nokia 6 – 32GB (INR 14,999 | USD $229) . Now one has to bear in mind that Nokia 6 hasn’t been released and the official registration of this Nokia 6 Mobile phone starts from 14th July 2017. There are rumors that it will be released in September of 2017. In case, it is released by next month, the winner will be shipped a brand new Nokia 6(32GB) by the end of August 2017. YOU CAN CHOSE ANY OF THE SOCIAL NETWORK TO ENTER INTO THIS CONTEST. We are going to enter the name of the contestants in an excel sheet for each point, which means if you gather 4 points, your name will be added 4 times into the sheet (15 times for 15 points). At the end of the month before drawing a winner, we will randomize the list of names in the excel sheet and then draw a winner. The winner will be chosen by feeding the total number of entries in the sheet into a random number generator. The number output by the generator will be hailed the winner of the contest (the number corresponding to the row and name in the Excel sheet). With each retweet, comment, share and like you will increase your chances of winning the grand prize. This is because your name will appear as many times in the Excel sheet as the number of points you carry (according to the point board given above). Anyone from India, US, UK and Australia can participate in this contest. In most the continents named above, Amazon is available. Therefore we will ship the winner the grand prize by purchasing it in their name and shipping it to their address. In case, your location doesn’t have Amazon services, we will look into some other method for delivery of the gift. For next contest, we are going to include our Facebook page as well as our Twitter page. The grand prize for the next month will be Apple IPhone 8 (64GB). Stay Tuned.